According to ComScore more than 50% of internet browsing is done on mobile devices. If your website isn’t optimized for mobile then you are missing out on 50% of potential traffic that could lead to additional business for your company. Your competitors are secretly hoping that you don’t join the mobile revolution and take the initiative to make your website mobile friendly. Missing out on potential website traffic by not being mobile friendly is just the beginning of your problem. Is your website optimized for mobile? Get a free mobile site evaluation now. According to ComScore more than 78 percent of mobile searches for local business information result in a converted lead or purchase, while only 61 percent of desktop searches result in a conversion. The key takeaway from this statistic is that mobile searches have a much higher conversion rate than desktop searches; thus making it critical that businesses optimize their website for mobile viewing. If your company’s website is not optimized for mobile then your website traffic and potential leads will bounce over to your competitors that likely have joined the mobile revolution. Another recent study by SEOcial found that 90 percent of consumers use multiple device screens sequentially, meaning that Omnichannel anticipates that consumers may start their buyer’s journey using one device and move to another as they progress towards their purchase. This makes it important that businesses provide a seamless customer experience across all digital channels if they want to thrive in this new multi-device environment. One of the most efficient and quickest ways to deliver this seamless customer experience for businesses that aren’t already optimized for mobile is through Responsive Web Design. Brands and businesses should already be aware they need to adapt to mobile. If your company isn’t already aware when you read this article then you might want to have a real serious conversation with your IT and/or Online Marketing Director. Despite the awareness, adapting your business to mobile is a process that can sometimes be confusing from a marketing and technical perspective. Many of our customers ask us what the difference is between responsive web design and a mobile application. Responsive web design became popular when businesses realized that if their website worked poorly on mobile devices that their potential customers would back out into a new search and jump over to a competitor’s mobile friendly site. A properly created responsive website design is able to self-adapt to any device automatically whether that is a laptop, tablet, or mobile phone. A native mobile application is a program that has been compiled to run on a particular OS and is downloaded from the Apple App (iOS) Store or Google Play (Andoid) Store. Native mobile apps allow for the best performance (speed and ability to use their platform’s full feature set). Native app development provides the most flexibility when it comes to providing specific business problems or needs. Their are pro’s and con’s to each, but the main benefit of going with a responsive web design approach is time and money. It is less expensive to create a responsive website design than a mobile application for your business because development time is significantly shorter. When clients don’t have a mobile presence at all then I always recommend they start with a Responsive Website Redesign so they can start penetrating the mobile market for additional traffic. Another option is hybrid app development which has emerged as a new solution to alleviate development time by allowing a single code base to be published across multiple platforms. A common hybrid platform we utilize at Upshot Media Group is the Ionic Framework. A hybrid option falls somewhere in the middle of the responsive web design and native mobile app solutions. Read more about the benefits of hybrid mobile applications here. Below we will go over the pro’s and con’s of Responsive Website Design vs. Native Mobile Apps. Sometimes it is easiest to understand the difference of these 3 mobile development options by viewing a list of pro’s and con’s. This should clear things up, but please feel free to leave any comments or questions at the bottom of this post. Responsive websites are easier and faster to develop than a native mobile application. 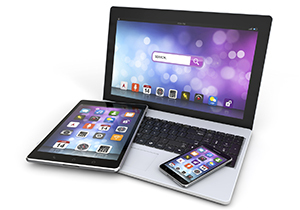 Responsive websites are less expensive to develop than native mobile applications. Developers don’t need to adhere to any OS guidelines or permissions, as they are developing a website that isn’t distributed through the app store. Responsive websites need an internet connection to work. It pulls information directly from a mobile browser. Responsive websites are not as quick or snappy as native apps because certain components such as images and animation need to load in the browser. UI and UX conventions for Android and iOS are different and never feel native or natural to users. Another aspect that is important to take into account is push notifications, which are a visible and effective way to attract the user’s attention. Responsive websites also can’t access phone functions outside of the browser like the camera or calendar. In addition, technologies like QR codes, voice recognition, and augmented reality can’t be used with responsive web on mobile devices. Is Your Website Optimized for Mobile? Click Here to Find Out.